Shoreham Football Club are already back for pre-season training. Sammy Donnelly’s squad reported back last Thursday after what proved to be a short summer break for all involved at the club. Mussels will be training twice a week, on a Tuesday and Thursday, right through the summer as they bid to put a season to forget behind them. A first campaign at Bostik League South level proved to be a turbulent one. Mussels managed just three league victories all season and were also slapped with a six-point deduction for ‘registration irregularity’. 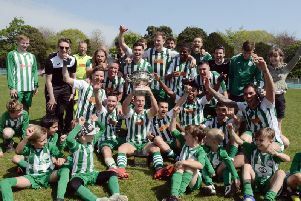 Shoreham’s relegation to the Southern Combination League has been confirmed in the past few weeks and Donnelly is eager for last season to be forgotten. He said: “I want my teams to be playing at the highest level possible but we’ve dropped down a division and we’ll be looking to start the season well. “I’m looking to go a different way and provide young players a chance to showcase what they can do at Shoreham. “Hopefully this approach will work and a new breed of talent will come through this club. “With the launch of the academy and our under-18s remaining at Bostik League level next season, I’ll have a chance to call upon some talented players when necessary. Goalie James Broadbent, defender Alfie Proto-Gates and forward Nick Collyer have all reached agreements to return to Middle Road next season. In an ideal world Donnelly would want to be working with a squad of around 20 players for the 2018/19 campaign. Mussels boss Donnelly has been in discussions with potential new recruits so far this summer. He added: “We still haven’t received any registration forms yet so nothing is set in stone as of yet. “What you can do is reach agreements in principle with players and then hopefully they do end up joining. “I have met with a few players this summer, the aim is to have a squad of around 20 for the new season. Shoreham have announced some prestige friendlies as their pre-season fixture programme starts to take shape. Bostik League Premier Division Whitehawk will visit Middle Road, while Mussels make the trip to take on the Hawks’ league rivals Burgess Hill Town. Shoreham will also entertain Surrey-based Westfield, who will play in the Bostik League next season. Despite the tough fixtures planned, Donnelly is relishing the tests his team will face going in to the new season. He said: “We have got some very tricky friendlies planned but that’s what I wanted.